During the 2015 OLED Evaluation Seminar (December 4) hosted by UBI Research, Professor Hong Mun-Pyo of Korea University gave a talk titled Flexible AMOLED Gas Barrier Technology Development Status. Through this presentation, he discussed in detail flexible OLED’s outline, technological issues, and encapsulation among other key issues. Flexible display signifies a display that was produced on top of flexible substrate, and not an existing glass substrate, which can bend, fold, or roll without breaking. Hong emphasized flexible display is the next generation display that can simultaneously satisfy consumers and panel makers, and an area that OLED can be more valuable compared to LCD. There are 3 essential issues in flexible display, substrate, TFT array, and display processes, as well as ancillary issues such as application and cost. Hong reported key issues regarding substrate and display process. 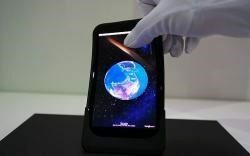 Flexible display uses plastic substrate, instead of glass, that is strong against shock and can bend. Therefore, handling technology that manages plastic substrate is considered a key technology in flexible display production. Hong revealed that for handling technology, a film lamination method and vanish coating method are mainly used. A film lamination method is where plastic substrate is attached to carrier glass using adhesive before being processed and a vanish coating method is where the PI substrate is coated to the carrier glass before processing. He emphasized that no matter which method is used, the debonding technology used to detach the plastic substrate from the glass plays a crucial role in deciding yield. Hong followed the substrate discussion with encapsulation technology. Encapsulation technology prevents moisture and oxygen that affect OLED panel’s performance from infiltrating in order to increase the display’s lifetime. As it is a core process that decides OLED panel’s yield, OLED panel production companies are focusing on optimum encapsulation technology development. Key issues of encapsulation technology that is currently being applied to flexible OLED, barrier coating related issues are considered the most important. Barrier coating is the coating applied to the plastic substrate to overcome the limitations that occur as existing glass substrate is replaced by plastic. For flexible encapsulation, as can type or frit seal technologies that were used for glass encapsulation cannot be used, face seal or TFE technologies that can be applied to flexible are used. Also, as the permeability of oxygen and moisture has to be 10-6g/m2day or less, high performing barrier coating technology is needed. When barrier coating is used to flexible OLED, generally 3 problems occur. Firstly, physically cracks or particles can develop. Regarding this, Hong explained that this issue can be solved if process is properly maintained. The second problem is micro defects that can arise on the surface of plastic film, which can be solved through optimized process, according to Hong. Lastly, nano-sized pin holes can come up. Hong revealed that multi-layers of barrier coating can solve this problem. Generally, when OLED panel is produced the thickness of encapsulation layer is not a big issue. However, Hong emphasized that the thickness becomes a core issue when producing flexible OLED panel. He reported that hybrid structure of encapsulation where gas barrier cover plate is attached to passivation layer placed via PECVD can be the solution. Although the most suitable process technology for hybrid encapsulation production is R2R, as appropriate results are not obtained when CVD is applied to R2R, Hong reported that research is being carried out toward the sputtering using direction. He revealed that if reflection plate is added to the sputtering equipment and neutron beam release is induced, defects that occur during the sputtering process can be reduced as the target thin film stabilizes. 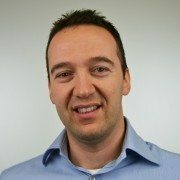 Dr. Mauro Riva, SAES Group’s OLED/OLET business developer, kindly answered a few questions regarding OLED for OLEDNET. He will be speaking at the 2nd OLED KOREA Conference (February 24-25, 2016) in Seoul, Korea. With much thanks to Dr. Riva for taking the time to answer some questions, here is the full script of the interview. What is your personal opinion on OLED’s marketability? I believe that OLEDs have just to leverage on their unique, distinctive properties, in order to enable brand new market segments, rather than entering competition in already crowded and established markets. I mean that the specificities of organic materials make them the only candidates for creating an entire future portfolio of portable, flexible, feather-light and, possibly, low power high definition display devices. Thus, the ability to generate really new, fancy, conformable and sustainable displays is, in my opinion, the first ingredient to boost OLED’s marketability. The second ingredient could be, in the long run, lower raw material and manufacturing costs, with respect to competing display technologies. Is there a particular reason for your choice to speak at the OLED specific conference rather than a more general IT conference? As an advanced materials Company, SAES Group have developed a comprehensive portfolio of functionalized polymer composites, to be integrated in a plurality of OLED device architectures. For this reason, an OLED specific conference is the perfect place to directly discuss the important theme of encapsulation, with the people working everyday on this peculiar technology. We wanted to have a direct and frank debate with scientists and technicians specifically involved in OLEDs, rather than in general IT themes, in order to be far more focused on the manifold organic diode encapsulation issues. What are the latest issues on OLED encapsulation? I think that OLEDs are nowadays facing the same issues they had since the beginning: basically, OLED materials are extremely sensitive to oxidizing agents and, especially, to moisture. This requires encapsulation materials with exceptionally high barrier properties, and active fillers or getters, capable of absorbing water on a single molecule basis. The optimization of many functional properties in single encapsulating materials is a very complex materials science problem. The fact that OLED materials can also be very sensitive to heat or radiations, generates many process constraints as well. It turns out that encapsulation materials must be specifically engineered taking into account the OLED structure, the device architecture, the chemical and physical nature of the materials and, nevertheless, the specific processes to be applied. Perfecting OLED encapsulation is thus a very challenging task, which requires deep technical interaction between advanced encapsulation materials providers and OLED makers. Could you tell me about development concept and characteristics? Also perhaps recent performances and outcome? As far as the Organic Electronics Business Development Area is concerned, we provide a very large portfolio of active edge sealants, active transparent fillers, dispensable getters. These products come as the result of our deep know-how in functional polymer composites, and they are specially tailored to address customers’ specific OLED designs and processes. Leveraging on our functional polymer composite technology, we have been able to develop solventless formulations, with water sorption capacities exceeding 13 percent in weight and very high flexibility and adhesiveness for fully bendable devices. Our products can be applied via screen printing, blading, syringe, ink-jetting, ODF and even be employed in thin film encapsulation structures, to make them simpler and more reliable. Together with the functional polymer composite based products, we also provide high performance tape dryers, as thin as 110 microns, for R&D and small scale bottom emission OLEDs. Another important class of products is related to AlkaMax: this technology offers an efficient and safe method of depositing ultrapure alkali metals. Our alkali metal dispensers and pills keep the alkali metal pure in the form of a stable salt, until it is thermally activated in the evaporation chamber. What are OLED related main manufacturing equipment type and who are your main clients? We see syringe dispensing as one of the main methods for dispensing our functional polymer composites. Ink-jetting is also becoming more and more widespread, together with ODF, especially for active fillers. As of today, we get the most revenues in this field from PMOLED makers. The AMOLED market is broadening, and we have some very good customers there as well, who are especially in need of effective solutions for smartphone and tablet size high definition displays. OLED lighting is still early stage, but we are already collaborating with the major players in that field, so far at R&D or pre-production stage. The main market for our products for the organic electronics market is indeed Asia. Are there any areas where you are collaborating with material companies? We have many collaborations worldwide, with other material companies as well. Regarding the functional polymer composite technology, we are collaborating in the areas of organic electronics, specialized food packaging and gas barrier films. We are also engaged in very fruitful collaborations with specialized equipment makers. I would just kindly invite everyone who is interested in OLED encapsulation to visit our website and to directly contact us, for deepening all the technical aspects about our product portfolio. The proactive and collaborating approach with our customers and the Research and Innovation focus have always been the heart of our Company way of doing: the OLEDs world offers us a real exciting and challenging arena for making innovation happen, together with all the players involved in this fascinating emerging technology. During the International Advanced Materials & Application Technology Expo (November 25-27), Professor Jang-Ung Park of Ulsan National Institute of Science and Technology (UNIST) gave an in-depth lecture on transparent electrode’s new technology and research results under the presentation title of ‘Technology Trend and Development Direction of High Performance Transparent & Stretchable Electrodes Using Graphene and Ag Nanowire Complex’. Transparent electrode is an electronic component with usually ≥80% transparency, and sheet tension of ≤500Ω/ㅁ of conductivity. This technology is widely used in electronics including LCD front electrode and OLED electrode in display, touchscreen, solar cell, and optoelectronic device. Park explained that the main market for transparent electrode is display and touchscreen, and announced that the transparent electrode market is to grow into US$4,800 million in 2020 from 2015’s US$ 3,400 million. The electrode materials that is mainly being used at present is ITO (indium tin oxide) film produced through evaporation or sputtering. ITO’s merits include good conductivity from the low sheet tension and suitable for mass production. However, China is the main producer of the rare main material, indium, and has a drawback of high processing temperature. As such, research for indium replacement is continuing. Graphene, CNT (carbon nano tube), Ag nanowire, and metal mesh are some of the materials that are in the spotlight as ITO replacement. However, Park emphasized that transparent electrodes that are being developed at present have difficulty in surpassing ITO in terms of electronical and optical properties. Instead, he explained that as the display shape changes, the replacement material can be used for displays where ITO cannot be applied. At present, ITO is being used as the main electrode material for flat display. However, its weakness against mechanical stress and limitation in flexibility led to some views that flexible display application will be difficult. Regarding this Park explained that thickness of substrate is more important than ITO’s traits for display’s curvature radius and therefore if substrate becomes thinner, ITO can be applied even to foldable display as well as flexible. He added that although folding the display is acceptable, stretchable display is impossible as the properties are destroyed when pulled. Park emphasized that in order for the wearable display market, including the smartwatch market, to grow, the comfort of the user is important. He reported as a human body does not conform to a specific curvature radius, to improve the user comfort, stretchable panel that can bend in diverse directions is a necessity. For this to be possible, transparent electrode that can replace ITO is required. For example, watch shaped application can be replaced with stretchable display up to the strap part that wraps around the wrist. Glasses shaped application can have stretchable display for curved areas such as lenses. Also, within textiles industry, research into smart textiles through electronic circuit application is continuing. As the transparent electrode that can replace ITO, Park suggested graphene and Ag nanowire complex. Ag nanowire reduces high sheet tension of graphene, and graphene prevents Ag nanowire’s oxidization, complementing each other. Park revealed that ≥90% transmittance and ≤30Ω/ㅁ was achieved through research. He emphasized as stretchability increased to 100%, it is suitable for stretchable display. According to Park, transparent electrode can be applied to transparent stretchable sensor and transparent TFT as well as display. With confirmation of continued research regarding this issue, Park concluded his presentation. At R&D Korea 2015 (November 19-21), ETRI (Electronics and Telecommunications Research Institute) revealed OLED lighting and graphene related research results. Since 2013, ETRI has been participating in ‘Graphene Applied OLED Device/Panel Technology Development’ project as a supervising organization. This project is a part of ‘Graphene Device/Component Commercialization Technology Business’, which is a Korean national project. This project’s ultimate aims include development of graphene electrode material with ≥15Ω sheet resistance, ≥90% transmittance, 3nm thickness, ≤5% sheet resistance uniformity, ≤5nm surface profile, and ≥5.5 generation area, graphene based protection layer that can be used for 5.5 generation 55inch OLED panel with ≤10-6 g/m2 WVTR, graphene anode OLED with ≥90% external quantum efficiency compared to ITO anode OLED, and diagonally 1300mm OLED panel prototype. In this exhibition, ETRI presented OLED lighting that used graphene as the electrode. ETRI’s Dr. Jeong-Ik Lee explained that recently interest in graphene electrode is increasing to replace ITO electrode and to apply graphene electrode, optical, electrical, and process issues have to be considered. When graphene is used as OLED electrode instead of ITO, thickness and refractive index change optically and electrically energy levels change, and these have to be considered when designing. He also emphasized that in terms of process, it has to be designed keeping in mind of before and after process of electrode procedure. Dr. Lee revealed that at present optical and electrical issues are solved while the process issues are in research stage, and they are planning to present the results of this research within this year. Graphene, with its high resistivity, is known as next generation electrode material favorable to flexible and foldable. Dr. Lee pointed out that graphene has wider viewing angle than ITO when used as transparent electrode is another important advantage, and particularly as white light source’s spectrum cannot change according to the viewing angle, graphene is suitable for application. Graphene is a key material with a wide arrange of applications, it is being developed in diverse areas such as OLED encapsulation as well as in electrode sector. The Ministry of Science, ICT and Future Planning of Korea estimated that domestic graphene market will record 19 billion KRW until 2025. Korea Evaluation Institute of Industrial Technology, the organization in charge of this national project, gave their target as developing 9 top technology through graphene and achieve 17 billion KRW sales. Regarding this, Dr. Lee emphasized compared to other countries, Korean investment in graphene is relatively low and that now is the time for the Korean corporations and government agencies to pay more attention higher value-added businesses. Dr. Mauro Riva, SAES Group’s OLED/OLET business developer, discussed his views on OLED in general as well as SAES Group’s technology through his interview with the OLEDNET and presentation at the OLEDs World Summit (October 27-29) titled ‘The Encapsulation Question’. Encapsulation is required to prevent the oxidation of emitting and electrode materials by blocking moisture and oxygen. It also protects the device from mechanical and physical shocks. The basic configurations of encapsulation can be divided into 3: glass-to-glass, barrier film lamination, and thin film encapsulation methods. Glass-to-glass configuration is applied to rigid AMOLED for mass produced mobile, barrier film lamination and thin film encapsulation methods are used for flexible AMOLED, and barrier film lamination is used for large area AMOLED panel for TV. According to Dr. Riva OLED encapsulation is still facing the same issues it had since the beginning: OLED materials’ extreme sensitivity to oxidizing agents and moisture in particular. He added that OLED materials can also be very sensitive to heat or radiations, generating many process constraints. Encapsulation technology is directly related to the lifetime of the OLED device and Dr. Riva raised several questions regarding the current issues surrounding the technology including the appropriate target lifetime, best definition of “lifetime”, and reliability of the “accelerated tests”. He emphasized that while much progress have been made, a “single optimal, universal solution” does not exist yet to meet various encapsulation requirements depending on OLED architecture, materials, environment, applications, etc. As such, encapsulation materials have to be specifically engineered to meet different types of OLED devices while having “exceptionally high barrier properties, and active fillers or getters, capable of absorbing water on a single molecule basis”. Thus, perfecting this technology is a very challenging task, and, according to Dr. Riva, something that requires in depth collaboration between advance encapsulation materials providers and OLED makers. For their part in this technology progression, Dr. Riva reported that SAES Group provides a very large portfolio of active edge sealants, active transparent fillers, and dispensable getters. He explained that the portfolio is the results of deep know-how in functional polymer composites (FPC), “specially tailored to address customers’ specific OLED designs and processes”. Discussing the FPC during his talk in OLEDs World Summit, Dr. Riva emphasized the versatility of this approach. Regarding application methods for SAES Group’s FPC products, Dr. Riva explained that they can be dispensed via screen printing, blading, syringe, ink-jetting, ODF (one drop filling), and even be employed in thin film encapsulation structures, to make them simpler and more reliable. Furthermore, Dr. Riva reported that while SAES Group considers syringe dispensing as one of the main methods for applying their FPC, “ink-jetting is also becoming more and more widespread, together with ODF, especially for active fillers”. Dr. Riva believes the FPC could play an important role in making the encapsulation more effective, and that SAES Group can “leverage on its advanced materials expertise” and in-depth getter/purification knowledge, to “perfect FPC based encapsulation solutions for OLEDs”. 11% of SAES Group’s net sales is allocated to Research and Innovation every year with strong cooperation with universities and R&D centers. The company is collaborating with many companies in diverse areas of interest such as OLED lighting, manufacturing equipment, specialized food packaging, and gas barrier films. This proactive and collaborating approach will enable the SAES Group to play a key role in developing more marketable OLED devices. On November 12, Visionox announced that they recently developed 604ppi (approximately 4.85inch) high resolution full color OLED panel through FMM (fine metal mask) using evaporation technology. In 2014, Visionox developed 570ppi RGB AMOLED panel with newly developed pixel structure, Z-Type. This Z-Type arrangement had larger blue sub-pixel with green and red sub-pixels beside it. The new panel has resolution of 604ppi which is a 35ppi increase from the 2014 panel. With this new reveal, Visionox displayed their high resolution OLED technology improvement. The 604ppi panel combined the self-developed pixel layout under proprietary intellectual property rights and co-developed Chinese FMM. The resolution is 2,560 × 1,440, manufactured using real RGB method and not pentile. 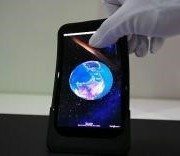 Chinese companies are developing their high resolution AMOLED panel technology at a fast pace. In August, EverDisplay presented 734ppi 6inch panel, and the technology difference with Korean panel companies is rapidly decreasing. Visionox revealed that this OLED panel shows Visionox’s research development for high resolution OLED is continuing and aptly demonstrated the current results. [IWFPE 2015] What Will Replace ITO? 2015 IWFPE (International Workshop on Flexible & Printable Electronics) was held at Le Win Hotel in Jeonju, South Korea (November 4-6). During the workshop, many OLED display related presentations commented on ITO’s replacement material. Dr. Jennifer Colegrove, CEO of US research company Touch Display Research, discussed hot trends of 2015-2016. Dr. Colegrove included high resolution, transparent display, wearable device, and flexible display in the hot trends. Of these she pointed out ITO replacement material regarding touch panel. She mentioning metal mesh, silver nanowire, CNT, and graphene as materials that could replace ITO. Dr. Colegrove added that the material has to be flexible in order to be applicable to flexible display and needs to have high efficiency. Hanwha Techwin’s Dr. Seungmin Cho announced that graphene, which has higher uniformity compared to ITO, will be the material of future. With lower resistance than ITO, graphene shows good characteristics, but Dr. Cho explained that high cost and particles produced are issues that need to be solved. He also commented that China selected graphene related national projects and is striving to develop the technology. Dr. Hyunkoo Lee of ETRI (Electronics and Telecommunications Research Institute) presented that the multi-layered graphene that ETRI, Sungkyunkwan University, and KAIST (Korea Advanced Institute of Science and Technology) co-developed will become the material that can replace ITO. He also introduced the results that as the transmittance is particularly high, it is suitable for transparent display, and compared to silver nanowire material in high resolution top emission structure, the display’s brightness is higher. ITO replacement development is an issue for the future of display industry’s progress. It is estimated that research development on graphene as one of the ITO replacement electrodes will be actively carried out. http://jpn.olednet.com/wp-content/uploads/2015/11/그래핀2.png 1015 975 OLEDNET http://jpn.olednet.com/wp-content/uploads/2015/09/logo_oled.png OLEDNET2015-11-11 17:09:222015-11-11 17:09:22[IWFPE 2015] What Will Replace ITO? During the IWFPE 2015 (November 4-6) held in Jeonju, South Korea, AUO gave a presentation on bendable AMOLED’s concept and technology first revealed in August. AUO’s R&D manager Terence Lai reported that the bendable AMOELD can actualize new user interface through applying display’s bending characteristics and this can be the innovation that could change the existing touch interface. AUO’s bendable AMOLED is 5inch with 295 PPI using the LTPS TFT and hybrid encapsulation with top emission structure. It has 02.mm thickness and through bending sensor of file type, it can process diverse functions by detecting different bending directions. Current flexible AMOLED trend is moving from curved to foldable, jumping past bendable. Key panel companies and research laboratories are focusing on developing foldable. It is anticipated that the AUO’s bendable AMOLED panel will provide new direction for the flexible AMOLED development that is heading toward foldable. Development of applications suitable to bendable and functions that utilizes bending characteristics are expected to be key issues. At IPEC 2015 (International Printed Electronic Conference), held on September 1, Professor Sang-Ho Kim of Kongju National University announced that silver nanowire technology is in initial stages of commercialization and will become display market’s key material. Kim reported that when the bending radius of flexible display is reduced, 2 key issues occur with silver nanowire used as TSP (touch screen panel) material. First, the wiring that are crossed when bending is loosened as can be seen in figure 1. Due to this effect the bending stability decreases. Kim explained that this effect can be solved by welding the two wires as shown in figure 2 using thermal annealing technology, laser process, and IPL photo-sintering technology. Another issue is a decrease in contact stability between nanowires at stress points when bending radius is reduced as shown in figure 3. During the presentation, Kim explained that this can be solved through undercoating process. This process involves mixing 2 polymers with different Tg (glass-transition temperature) and layering it as in figure 4, and placing TSP on top. Silver nanowire has benefit of being more flexible and less resistant compared to transparent electrode material, ITO. As such, it was spotlighted as TSP material most suitable for flexible OLED. Nonetheless, silver nanowire has been considered to fall behind ITO in panel mass production unit cost in display market. However, haze effect which happens when sunlight is reflected off the silver nanowire TSP has been solved recently, and new touch technology that requires improved TSP functions, such as post-touch technology, has been developed. Accordingly, products that use silver nanowire are increasing despite the unit cost difference. Kim reported that as TSP sheet resistance can be reduced through undercoating and welding technology and greatly increase bending stability, it is estimated that silver nanowire’s marketability will grow for flexible display. At present, FMM (Fine Metal Mask) is considered the main method for large area RGB OLED panel production. However, due to shadow effect, mask total pitch fluctuations, and mask slit tolerance issues, there is a yield limitation to this technology. This limitation increases as the resolution becomes higher; minimizing the number of FMM during the OLED panel production has been a key issue in RGB OLED production. In SID 2014, through a paper titled “Novel Two Mask AMOLED Display Architecture”, UDC revealed a technology that can reduce the number of masks used in RGB-FMM method to 2 from previous 3. As shown above, this technology coats yellow and blue subpixels using 1 mask each. Following this process, green and red color filters are applied above the subpixels. Pixels are formed as illustrated below. UDC explained that this technology improves lifetime of the display overall and reduces energy consumption as blue voltage can be lowered. Additionally, tact time can be reduced through this technology, and increase the yield. In IMID 2015, UDC presented research of the same title. However, the content of the presentation unveiled more developed research compared to 2014. First of all, in 2014, UDC announced that the panel’s lifetime could be improved by 2 times compared to the RGB method. In IMID 2015, UDC’s announcement changed the figure to 3.3 times increased lifetime. UDC also revealed that the technology can be actualized through printing method, and has the advantage of being able to print 2 rows of pixels at once. UDC announced that this is most suitable when OVJP (Organic Vapor Jet Printing) applies the printing method. A new technology called SPR (Sub-Pixel Rendering) was also announced by UDC in this paper. The 2014 SID paper included a method that did not uses SPR. As shown below in figure 1, 4 subpixels of RGY and B are used per pixel. During IMID 2015, UDC presented APR technology applied pixel structure. Figure 2 shows 3 subpixels per pixel. In this case, as the pixels can be arranged as shown in figure 3, smaller number of subpixels can be used. UDC announced that because APR technology allows the number of subpixels per pixel to be reduced to 3 or less, the number of data lines and TFT per pixel can also be reduced together. UDC explained that this technology can be applied regardless of the display area or resolution, and will be able to be applied to different types of panels.